Your car or bike is an important personal investment and asset. Whether you have a new car/bike or you are a used car/bike owner, it comes with lots of responsibility. A well-maintained vehicle offers better performance, better mileage, and of-course better driving experience. Tell your bike/car that you care with MotorCare Services. Droom is providing extensive automobile services starting at ₹99 for limited time. Services like car care detailing, road side assistance, and warranty are a must have for any vehicle owner. Get this exclusive offer till 20/02/16 and save a buddle of rupees. Regular car care detailing will give your baby a showroom like-look, enhance life of car and reduce overall maintenance cost. Shining, dust free car is obviously appreciated. 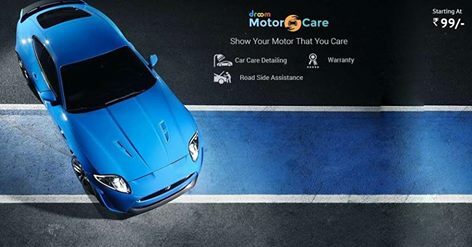 At droom.in you can find different car care detailing plans that offers doorstep service at your convenience. As the weather has changed, and if you are planning a road trip, don’t forget opting for road side assistance. It’s offers a great backup plan in case of any sudden mechanical breakdown, flat tyre, run out of fuel, locked car, and more solutions. Get different plans at with Droom Road Side Assistance, which gives you cover throughout the nation. Stay safe on not-so-friendly roads and highways with competent RSA services. Sudden car repairs can surely put your monthly budget on fire. Scary? Right! So, before such a condition arises be prepared with a comprehensive warranty plan. A warranty plan covers your unexpected repair cost and gives you peace of mind. There are different warranty plans available at Droom for 6 months or 1 year. You can choose a plan as per your convenience and get security for money. What are you waiting for? Rush, take advantage of automobile services starting from ₹99, only at droom. Limited availability left.